Don't just wear it... share it. Radio X takes a look at the most memorable and coolest band t-shirts around. 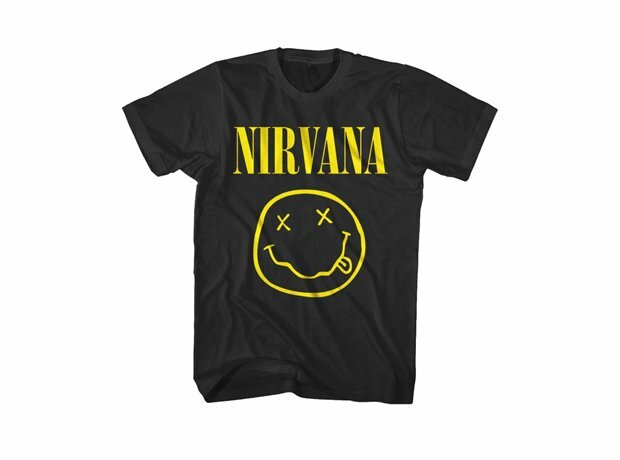 Nothing says 'I lived through the 90s' quite like a smiley face and a Nirvana shirt. Kasabian’s Ultraface T-shirt in neon pink will ensure you don’t get lost in the crowd. Is anything more instantly recognisable than the Rolling Stones logo? Created in 1970 by John Pasche, the pop art design has stood the test of time. But this limited edition Aussie tee is one of the most ingenious uses of the tongue we’ve seen so far. We can’t help wondering if this T-shirt featuring the band's The Balcony album artwork is just a suggestion of what to do at their gigs. There's nothing quite like merging your song knowledge with a declaration of love. With this eye-popping number from The Vaccines, you can make sure you'll stand out from the crowd. Nothing evokes the Britpop era more than an Oasis T-shirt, but is it cool enough? Definitely Maybe. The Smiths guitarist and all-round mod god needs no introduction… which is probably why this t-shirt was made. Joy Division's Unknown Pleasures print proves that sometimes, when it comes to band t-shirts, less is definitely more. David Bowie’s Aladdin Sane era tee is a must-have for any fan, but this one of the star is infinitely cooler. This epic Foos T-shirt honours the moment Dave Grohl broke his leg on stage in Sweden. Despite being in excruciating pain, the frontman kept on playing like an absolute legend… until he had to be airlifted away for emergency surgery, of course. Rock on Dave. Rock on. Sometimes a band is so iconic, the names of its members are enough to do the trick.